There are plenty of dining occasions that call for splurging on a simple, yet indulgent, classic meal -- one that doesn’t involve "small plates," or even vegetables, really. You know, times when only a thick, juicy New York Strip, a perfectly portioned filet, or an effin’ huge Cowboy steak will get the job done. 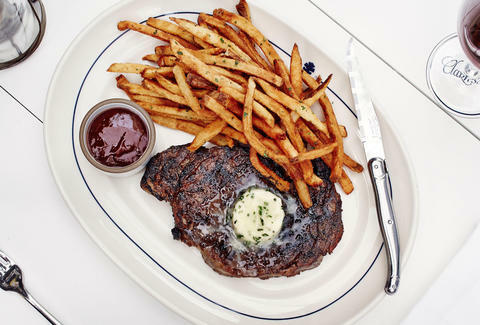 Austin has steakhouses offering a Rat Pack vibe, as well as more relaxed atmospheres. Any way you cut it, these seven spots have the wagyu to win you over. If you can only have one steak destination on your bucket list, make it Jeffrey’s. 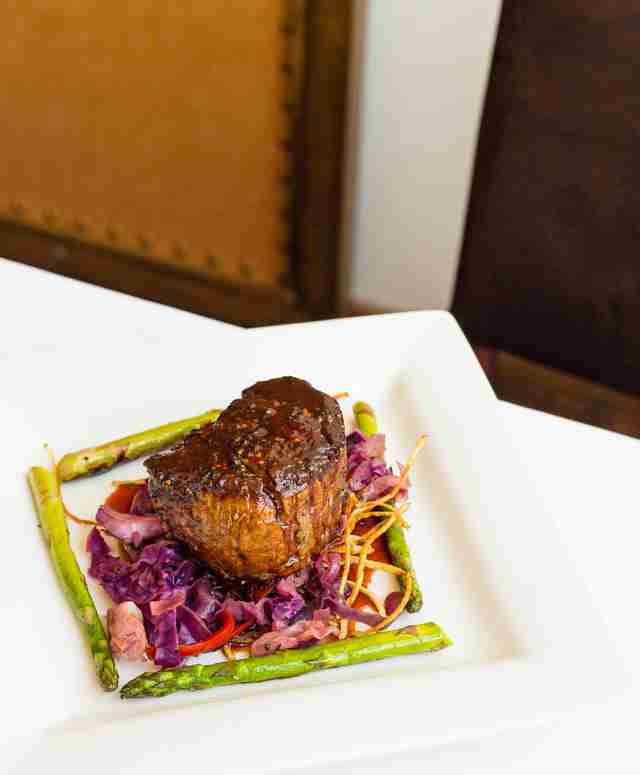 The combination of food quality and service is unrivaled. A face-lift in 2013 -- after being purchased by MMG (which also own Perla’s, Clark’s and Elizabeth Street Cafe) -- has breathed new life into the elegant eatery, and earned the attention of a whole new generation of diners. Consider going big with the 26oz Texas wagyu bone-in rib eye -- it’s been dry-aged for 32 days, then grilled and roasted over local live oak, and finished in a hot broiler. Go ahead and add the foie gras butter; you’re worth it. As if getting down on a huge bloody steak wasn’t enough of a carnivorous venture, celeb chef Tim Love took it several steps further with wild game options. At Lonesome Dove, you can have your steak, boar, elk, and buffalo with a tasty side of rabbit-rattlesnake sausage. And, if you’re up for the challenge, check out the hand-cut wagyu tomahawk steak served with serrano lime butter. 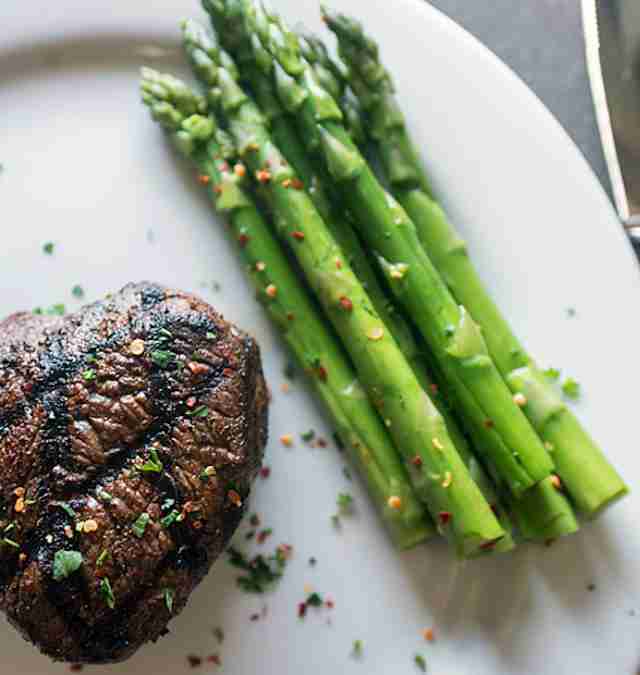 Vince Young Steakhouse blends exceptional service with a wide variety of exceptional aged prime cuts like The Perfect Ten -- a whopping 14oz, perfectly seared steak that cuts like butter -- made from Texas Akaushi beef. Even though you're dining in a steakhouse as a mature adult, there's a ridiculously rich, creamy mac & cheese topped with house-cured bacon that is impossible for your inner child to pass up. With locations all over Texas, Perry’s tricks out its Austin outpost with a vintage vibe and an attentive waitstaff, which is always on point with drink recs. The fried asparagus topped with jumbo lump crabmeat is a signature for a reason (and also a clever way of getting you to eat vegetables). 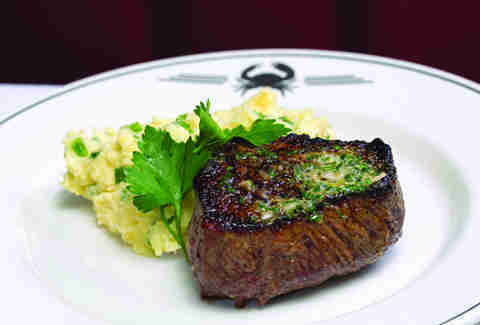 Try the Prime New York Strip, topped off with herb-garlic butter. No need for A.1. Sauce in this joint. 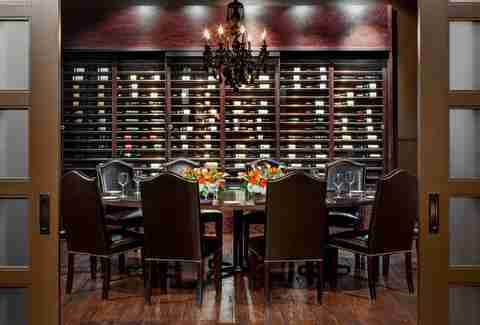 Truluck’s is the kind of restaurant that lends itself to special occasions, dates, and business dinners you're all too happy to comp. The upscale seafood and steakhouse is perfect for those who like a little surf with their turf, like the Dynamite Filet, a 7oz filet topped with blue crab, rock shrimp, and Maine lobster in a Sriracha cream sauce. Because good booze and good dining go hand in hand, try the Dark Horse cocktail -- a classic Manhattan made with coffee-infused Knob Creek bourbon. 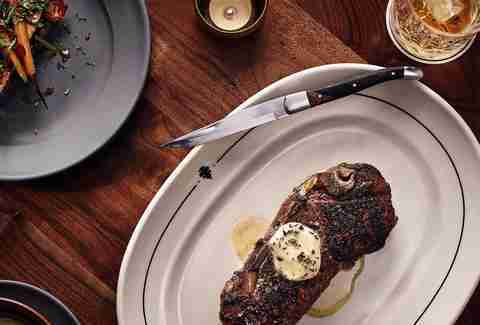 Salt & Time is not technically a steakhouse... and actually, it’s only 50% restaurant. The skilled and passionate crew source meat from local farms and butcher it in-house. 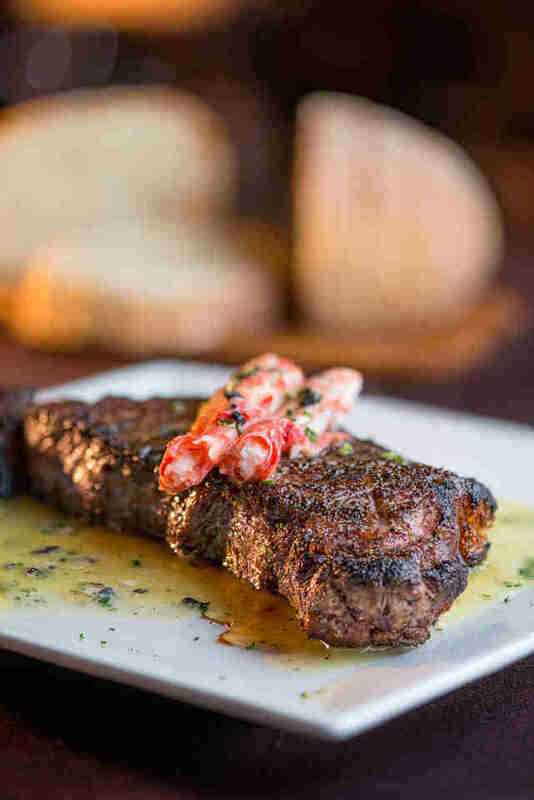 Each day, it offers a Butcher’s Cut menu with eight to 10 high-quality offerings -- including Angus and wagyu -- cooked to medium-rare heaven in addition to the meat-focused daily menu. If you’re ready to master your home steak game, Salt & Time’s butcher shop has fresh (or aged! ), gorgeous steaks ready to be wrapped and weighed. This is not your local grocery store’s beef. Austin Land and Cattle' is pushing 20 years in business, and with good reason: the relaxed (by steakhouse standards) atmosphere sets the stage for distinctly Texan takes on steakhouse classics like the Shiner Bock Battered Mushrooms, which set the stage for meatiness like a 22oz bone-in rib eye that's more than fine on its own -- but then, a little jalapeño bleu cheese or Maker's Mark bourbon sauce never hurt anyone, right? Anastacia is a food/drink/culture writer and steak connoisseur whose eyes are bigger than her stomach. Follow her to sad, brown, microwaved steak: @anaurie.